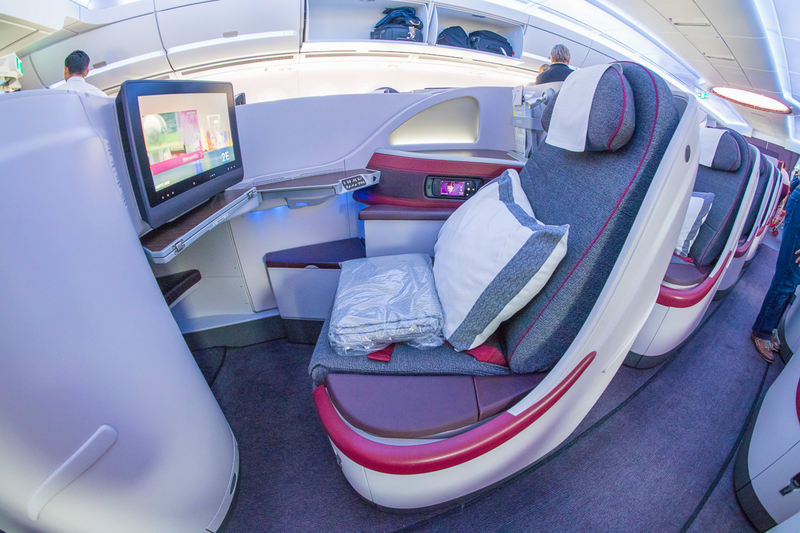 As part of an annual trip to Europe in May this year I booked a return Asia Miles First Class redemption booking from Sydney to Frankfurt flying Qatar Airways to Frankfurt and Cathay Pacific return to Sydney. Qatar doesn’t offer First Class on the flight from Doha to Frankfurt, nor does Cathay offer First Class from Hong Kong to Sydney, but I specifically selected this routing to tick off several personal firsts; first time experiencing Qatar, first time on an Airbus A350, and first time flying Cathay Pacific First Class. 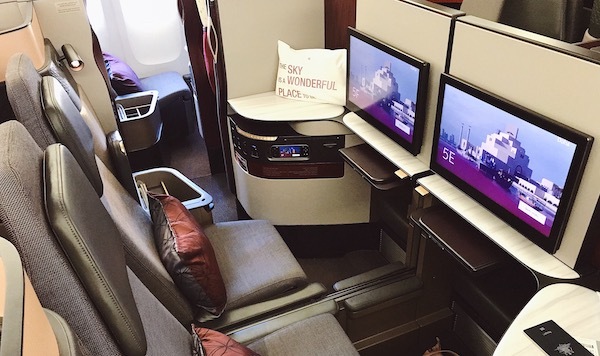 I used my corporate American Express Platinum Charge card to transfer 260,000 Amex Membership Rewards points to Asia Miles. 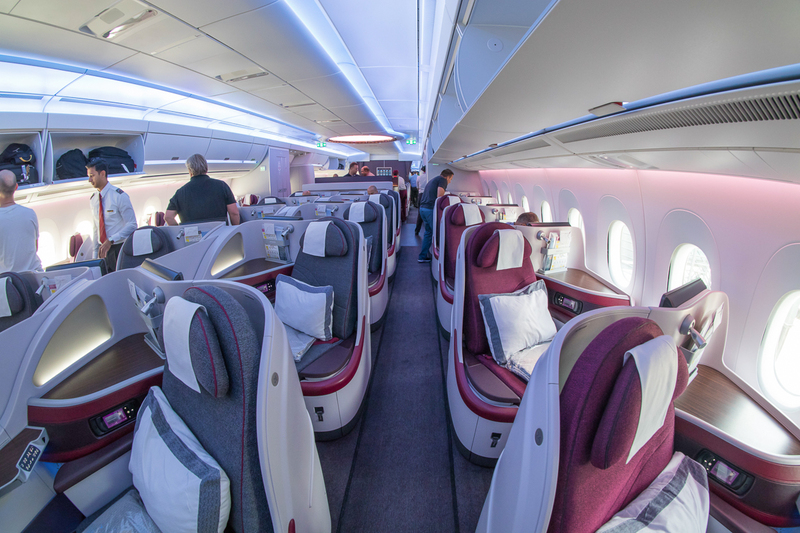 As of May 2017, Qatar Airways has 13 Airbus A350-900 aircraft in its fleet with another 30 A350-900 and 37 A350-1000 still to come. 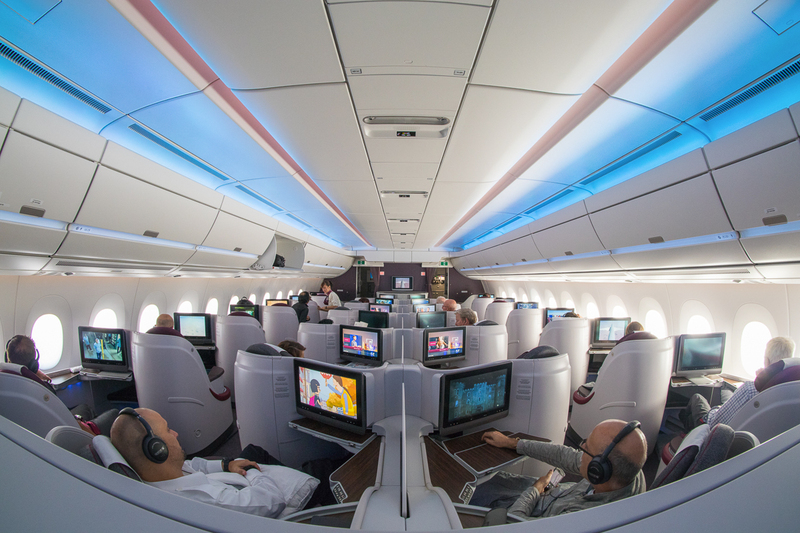 The Business Class cabin has a total of 36 seats split into two zones separated by the second door entrance and the bar. Up front there are 24 seats arranged in a reverse herringbone 1-2-1 configuration and there are another 12 seats behind the bar. 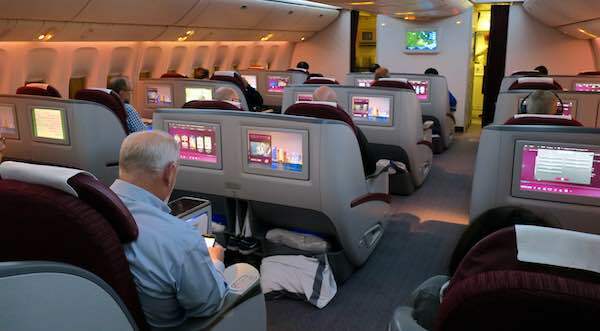 Further back there are 247 economy seats arranged 3-3-3. 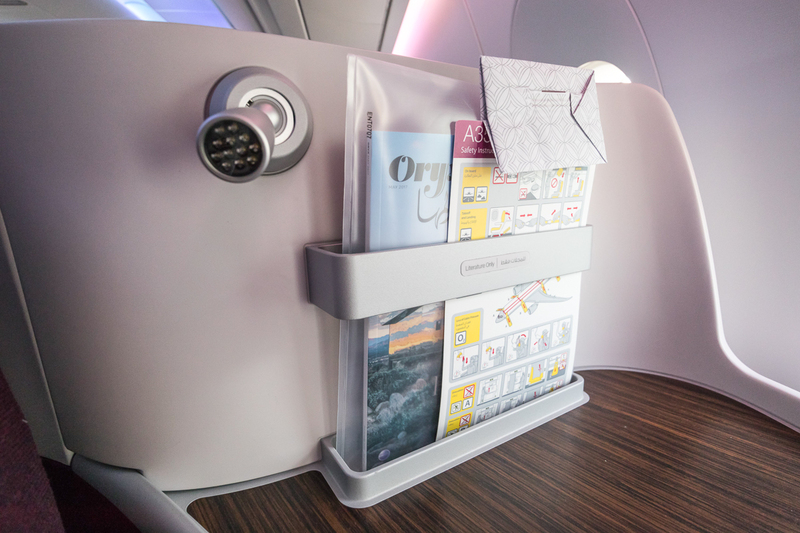 There are no overhead bins down the centre of the cabin, making the cabin feel very spacious. 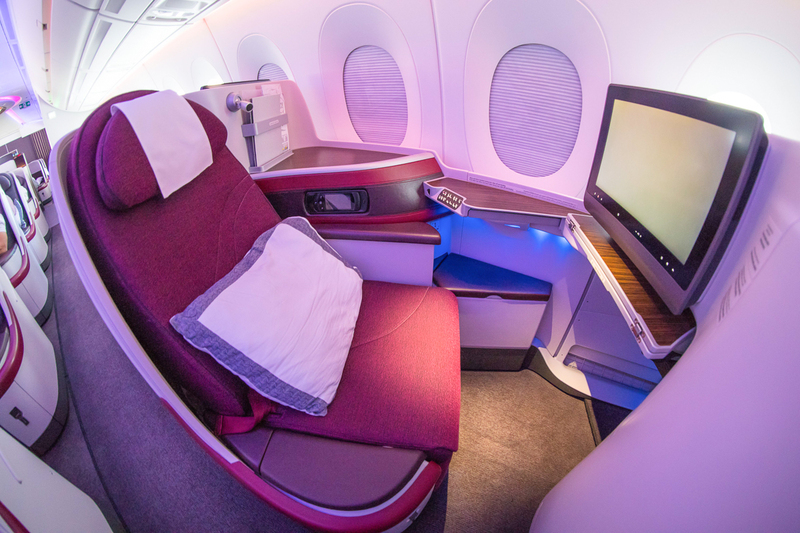 Qatar Airways has installed its latest generation Business Class seats onto its new A350. 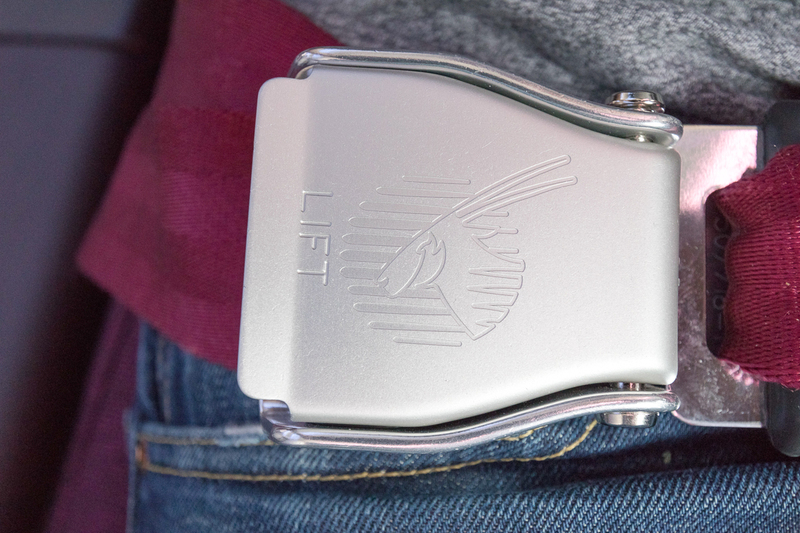 The seat is manufactured by B/E Aerospace and is also the same seat used on its Boeing 787 and Airbus A380. 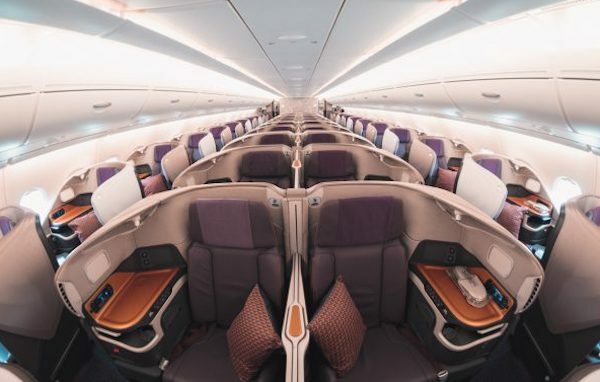 The excellent ‘Super Diamond’ seat may look familiar to some Australian frequent flyers as it’s also the same seat used by Virgin Australia in ‘The Business,’ although both seats are heavily customised by their respective carriers. 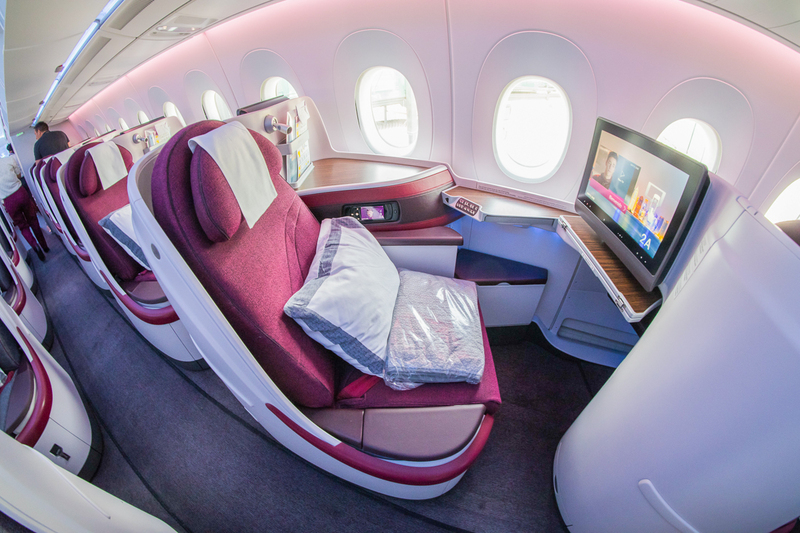 The only downside to the Qatar Airways version was the lack of wings on the seat shell to provide some privacy at head level. 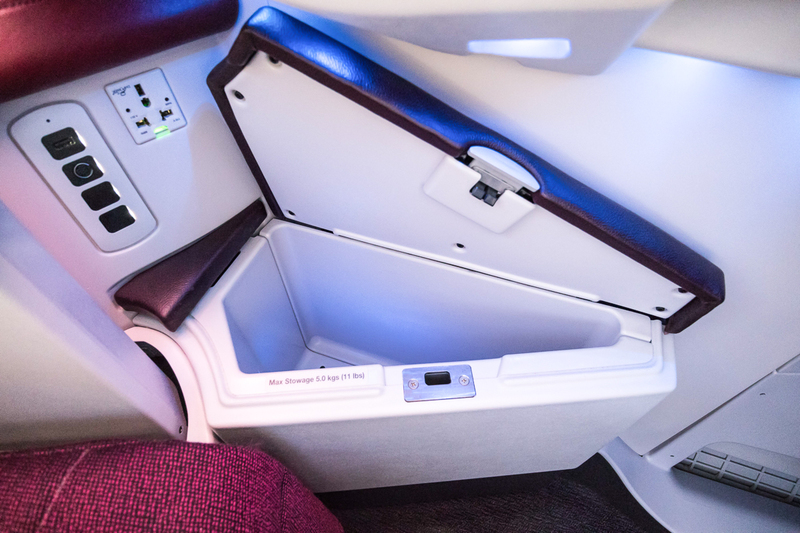 There is excellent storage around the seat, with a bench along the window with literature holder; drawer under the seat in front which was perfect for shoes; armrest which had a water bottle; and noise-cancelling headphones plus a large storage bin next to your knee which has USB adapters nearby. This storage bin was great to charge valuable electronics in the with the lid closed with everything out of sight. 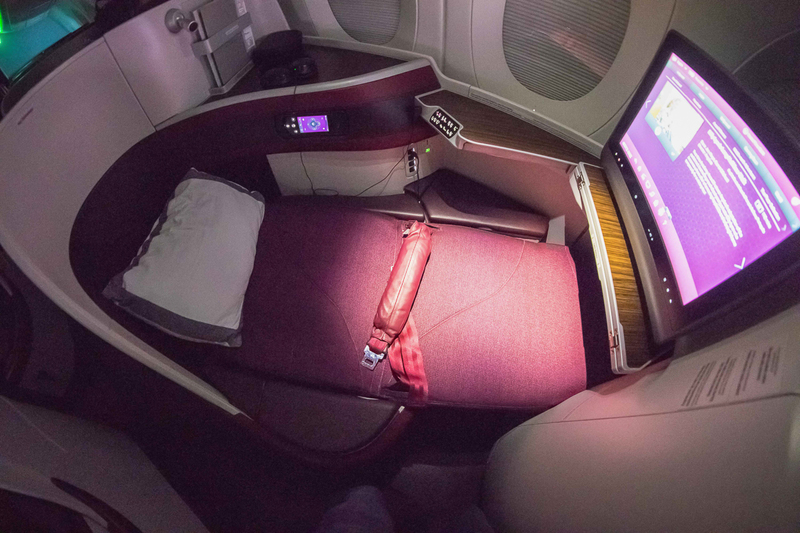 The seat converts to a lie-flat bed, however, as it was a daytime flight to Frankfurt, no pyjamas or turndown service was offered. Instead, a light blanket was provided. You can’t go wrong with any seat. 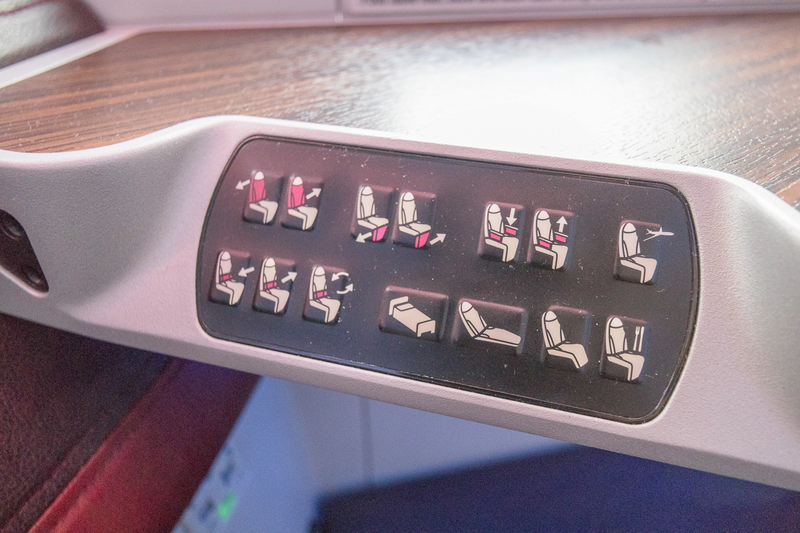 Window seat lovers will choose any A or K seats, which angle towards the window, whilst those travelling together will want an E and F centre pair which angle towards each other. 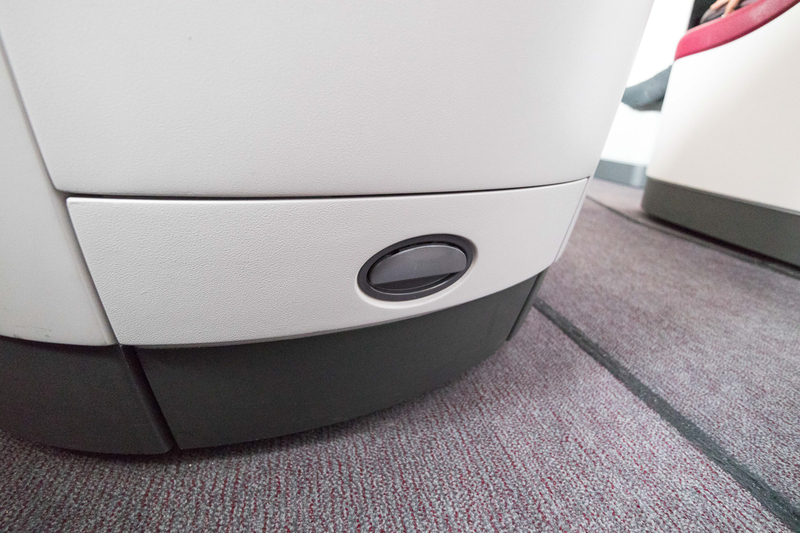 Even if you are assigned an E or F seat and you’re travelling solo, the privacy dividers are raised between the centre pairs on boarding so you don’t have to worry about any awkwardness between you and your neighbour when someone raises it. 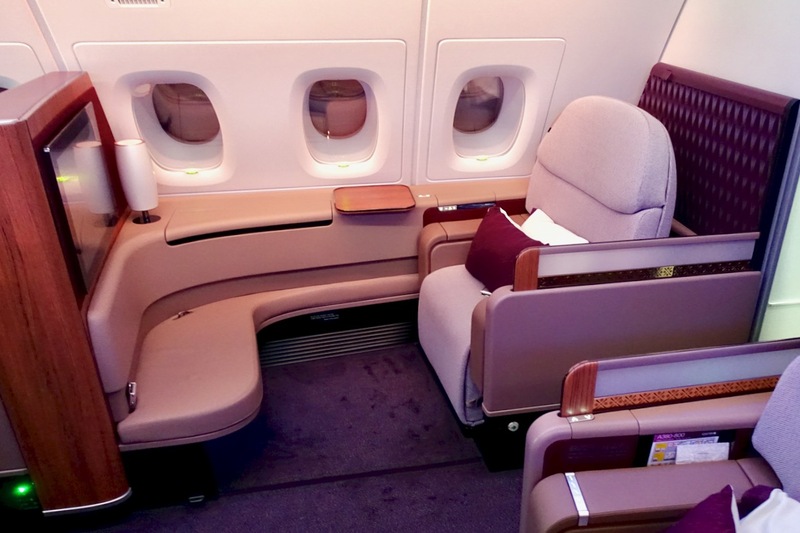 I was impressed that the Cabin Service Manager, Mee, personally introduced herself to everyone in the Business Class cabin by the time the meal service started. 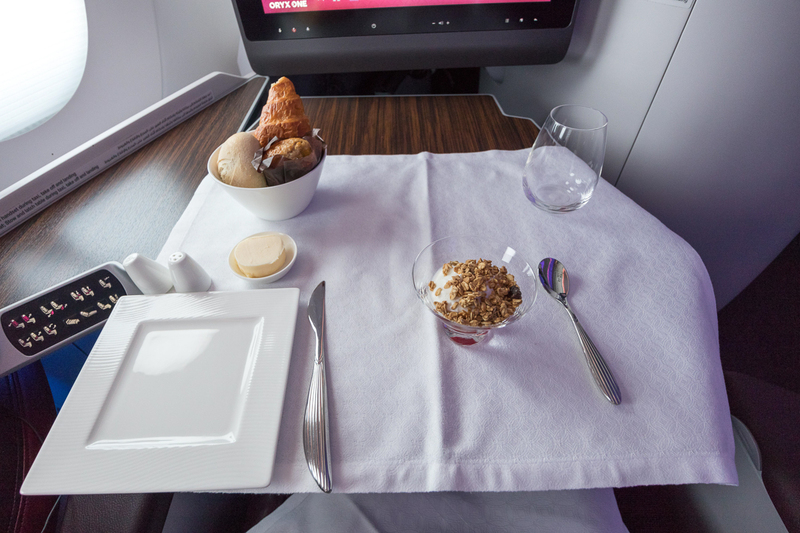 Although I had just been served breakfast on the flight from Sydney, breakfast was the first meal offered on the flight to Frankfurt. The menus are beautifully presented and have extensive meal options. 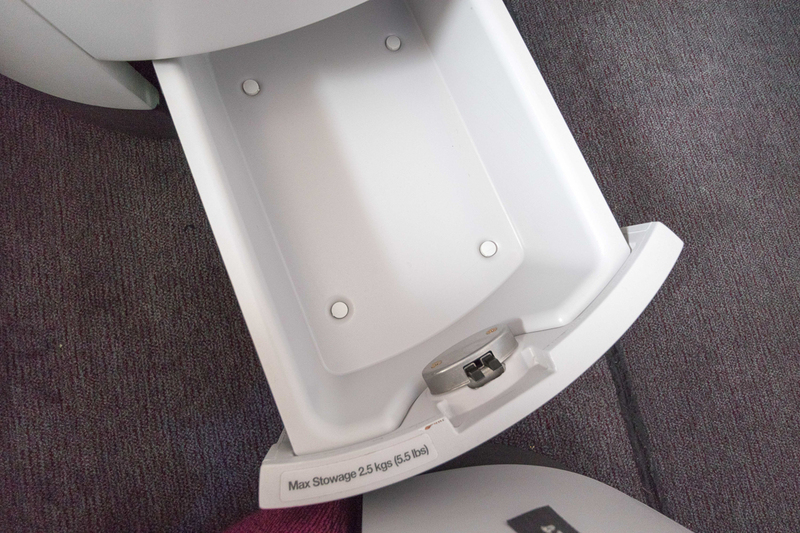 There are no trolleys through the cabin or meal trays, and the crew sets your tray table before the meal arrives. 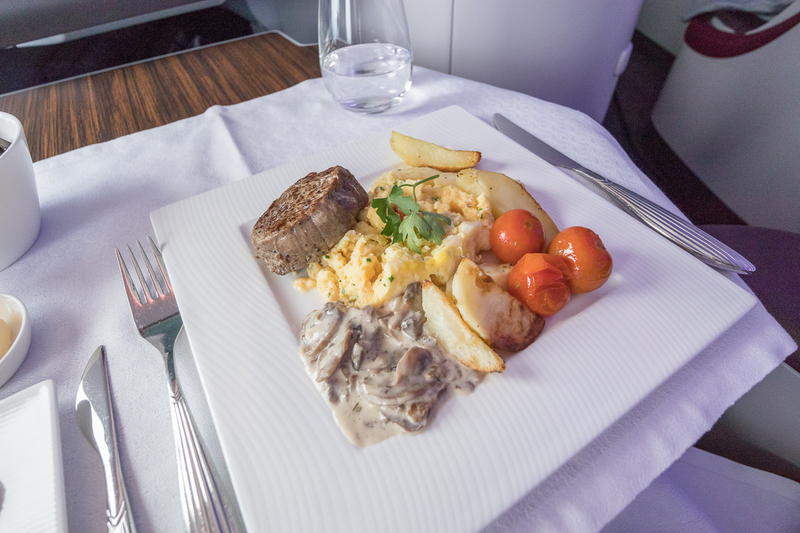 The breakfast was cooked to perfection and I’m not sure if it is due to the quality of the galley equipment or the lower cabin pressure of the A350 but everything had more flavour compared to the First Class A380 meals from Sydney. 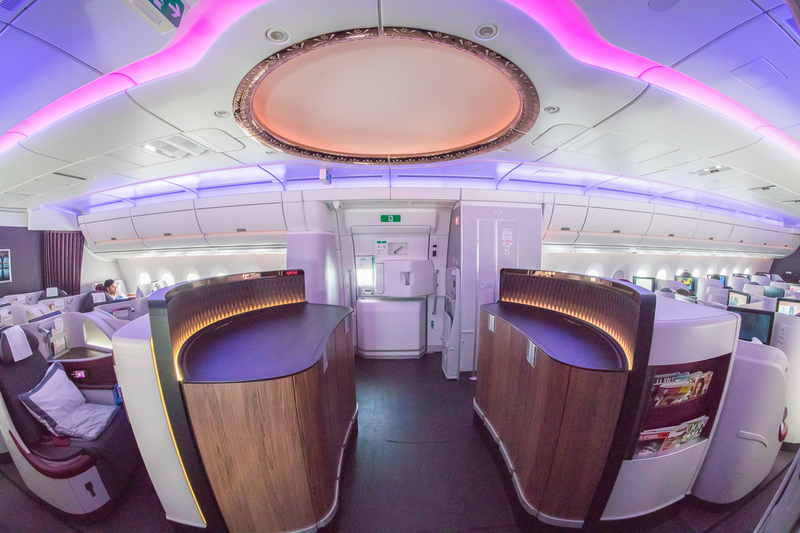 Although the crew didn’t come through the cabin offering a second meal service, you could order anything from the ‘light options’ menu at any time during the flight. 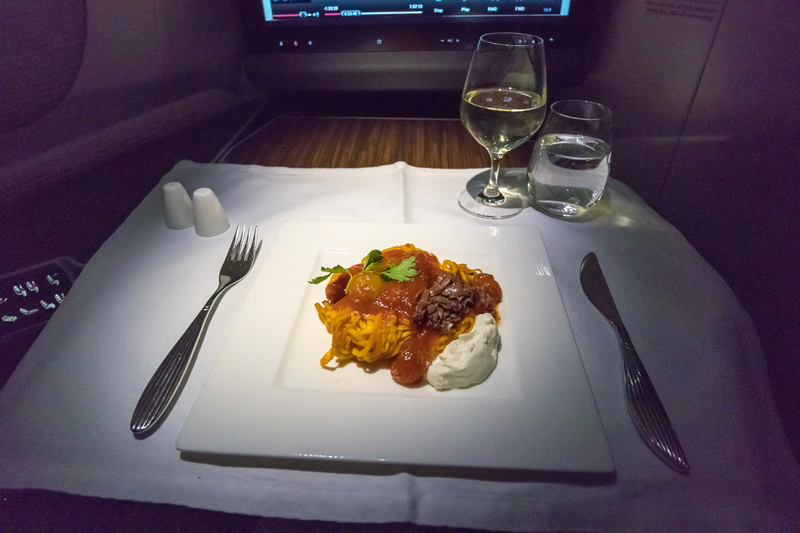 Two hours before landing I ordered the linguine pasta in Pomodoro sauce which was delicious. Although wifi was available, I did not get a chance to test it. 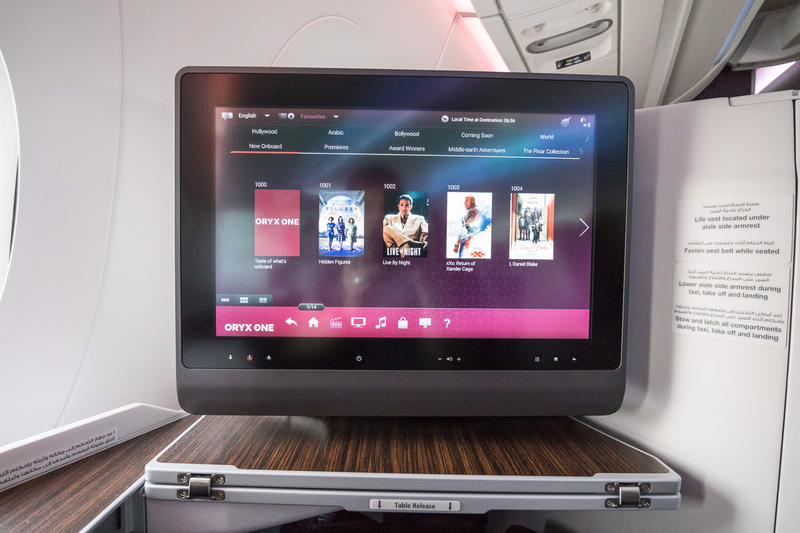 Both Qatar Airways and the Airbus A350 aircraft lived up to my high expectations, unlike my First Class flight to Doha, which was very similar to Keith’s experience on the A380. 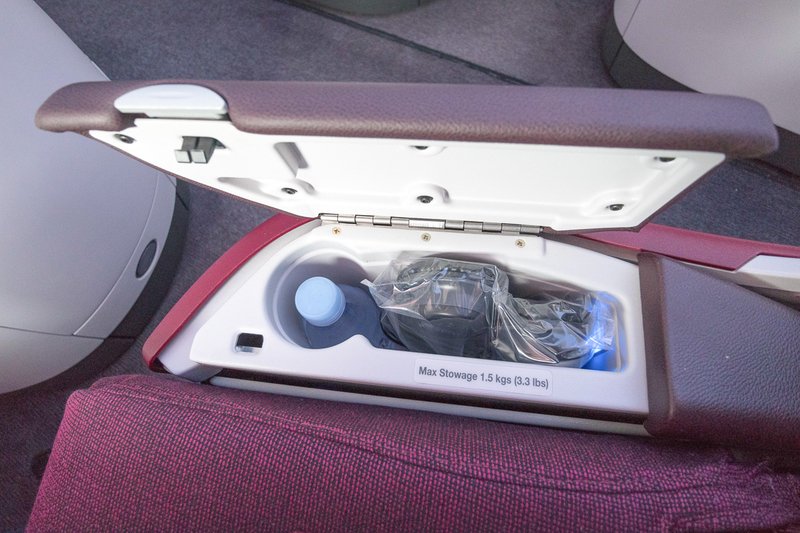 The seat is consistent and comfortable for all passengers with many storage spaces and is wide enough when converted to a bed. The service provided by the crew was professional yet personable. They also anticipated my requirements by offering me another coffee during breakfast and top-ups to my wine over lunch. There was extensive food and beverage options and everything I tried tasted wonderful. Plus, the fact there were no trolleys or trays during the meal service made it feel like a truly premium Business Class experience. 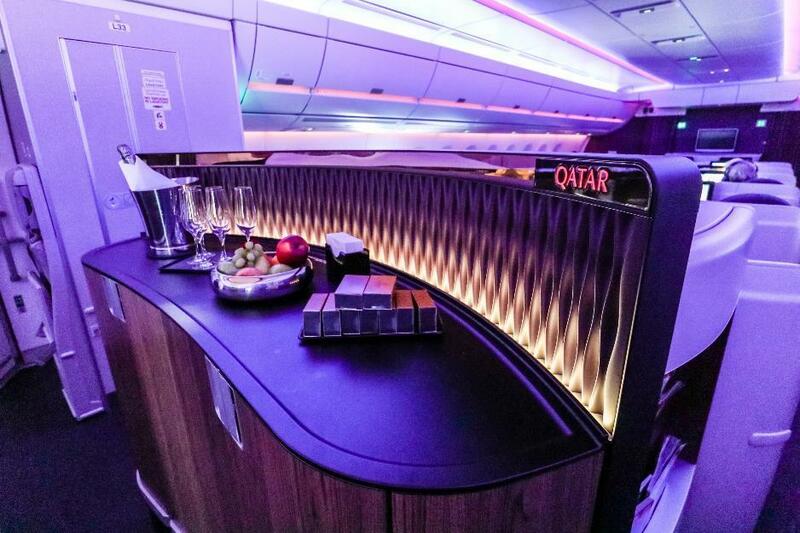 I would have no hesitation booking another Qatar Airways Business Class flight. Greg got bitten by the travel bug at a young age while travelling with his Dad on business trips to Asia. He took over the family business in 2012 and uses it to maximise his loyalty points earning. His obsession with earning and burning loyalty rewards points allows him to travel over 100 days every year. You can see more of Greg’s travels on Instagram. Any idea of when the QSuite product will be introduced? We are flying BCN > DOH in August 2018 in business. 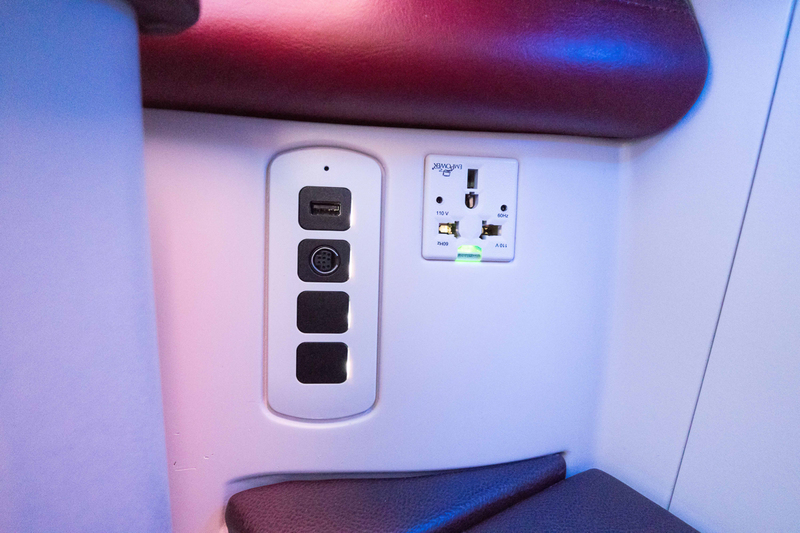 Hoping that QSuite on the 350 will be available then. 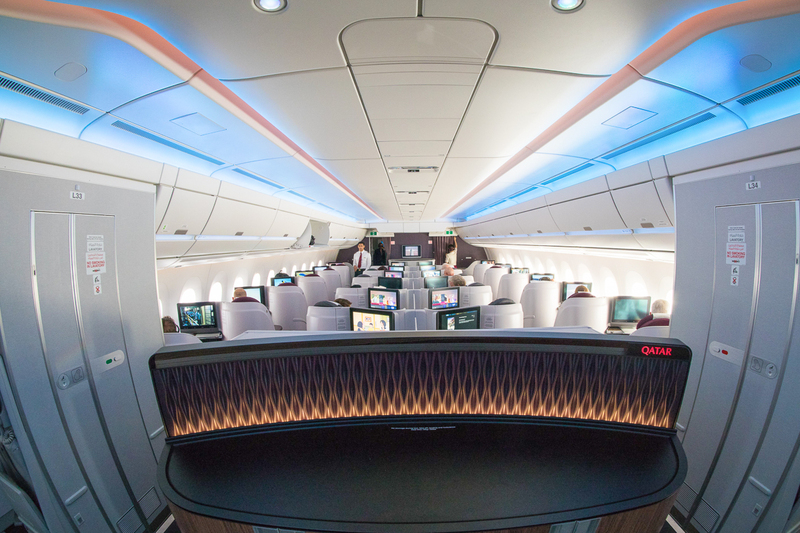 There are no plans to retrofit the A350 fleet with QSuites – it’s only for the 777 at this stage. The A350 is a gorgeous plane to fly on, it’s so quiet it’s easy to forget you’re actually on a plane. We love how Finnair promote the fact “900km/h and the loudest noise in the cabin is the clinking of ice cubes”. 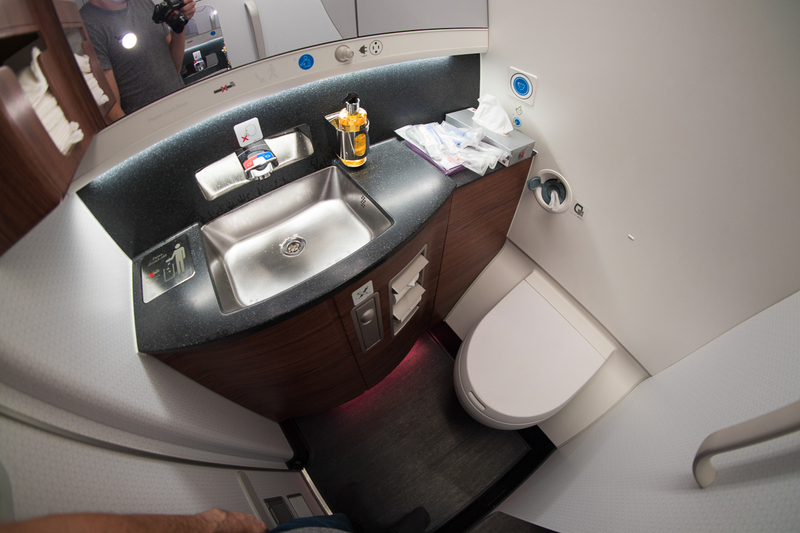 We really enjoyed Finnair’s offering & hospitality in business class on our recent A350 flight to Helsinki & back. 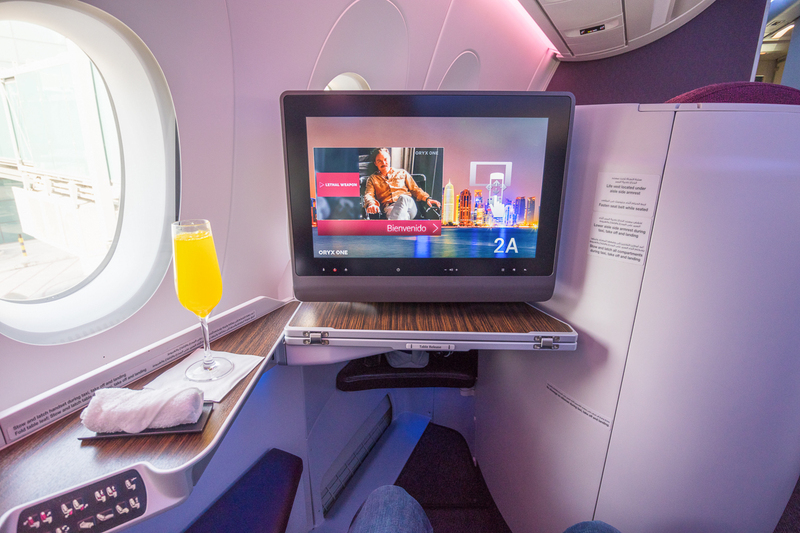 Finnair have a great product and fly their A350 to & from London once a day and to an ever-increasing number of longhaul destinations. 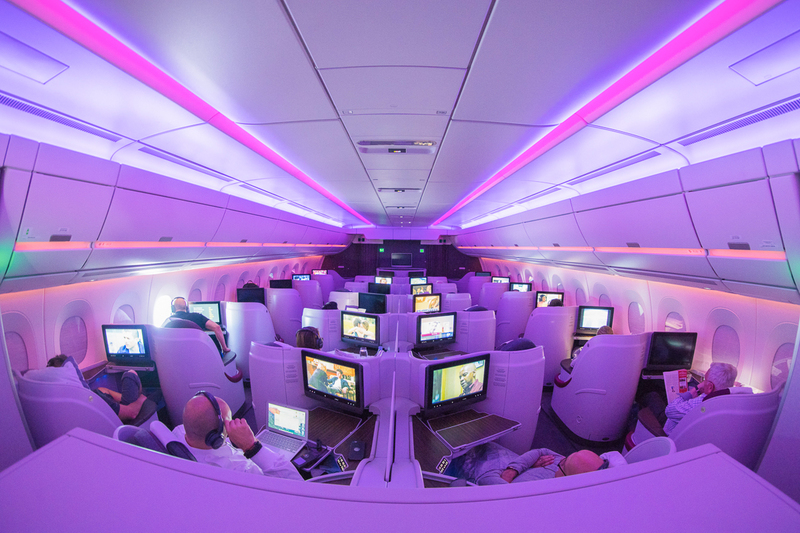 Would we fly on the A350 again? Most definitely! 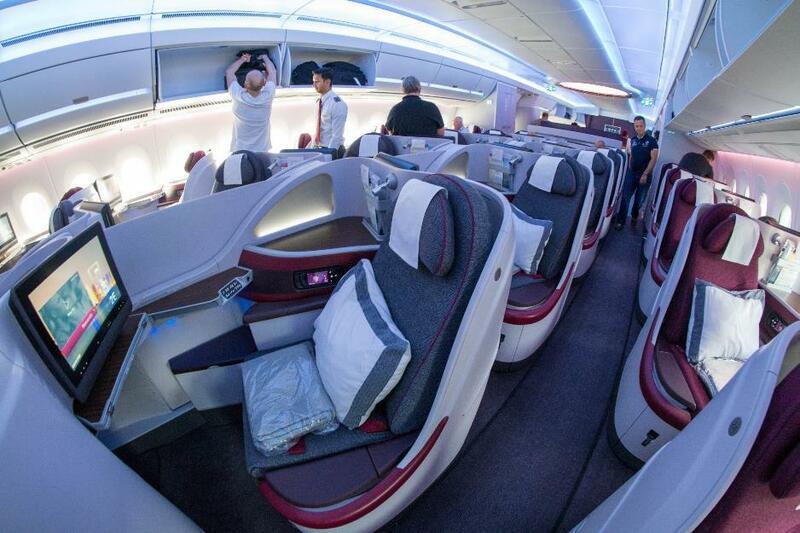 Really looking forward to flying Qatar Airways’ A350 and checking out their new Q Suite! 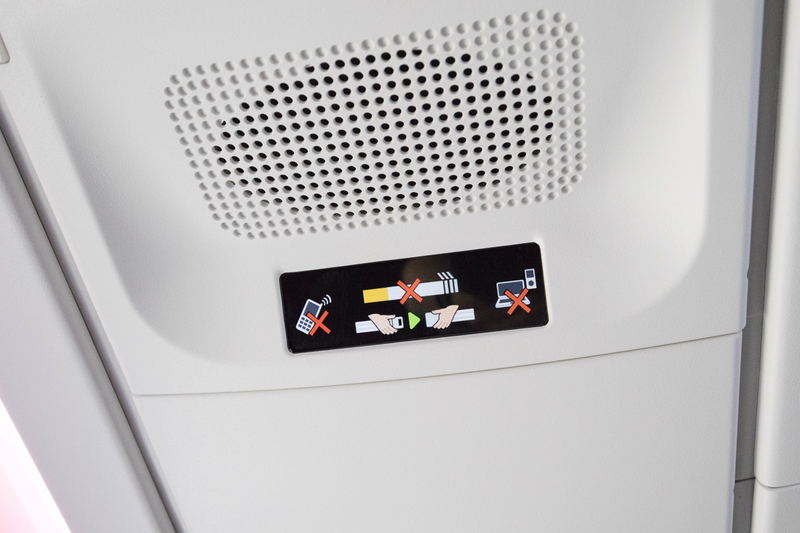 Croweater, other than a slightly longer flight to avoid hostile airspaces (maybe an extra 15-30 mins), you shouldn’t experience any inconveniences. Enjoy your flight! 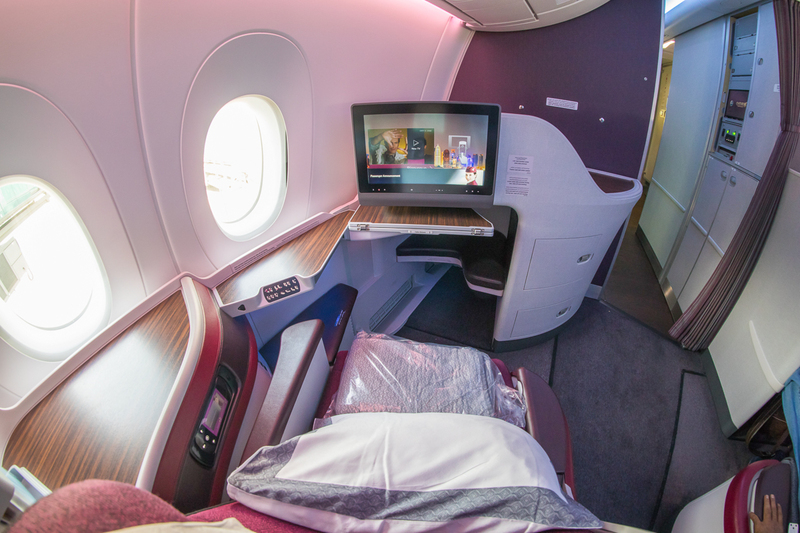 The QR A350 J product really is a good use of QF points. 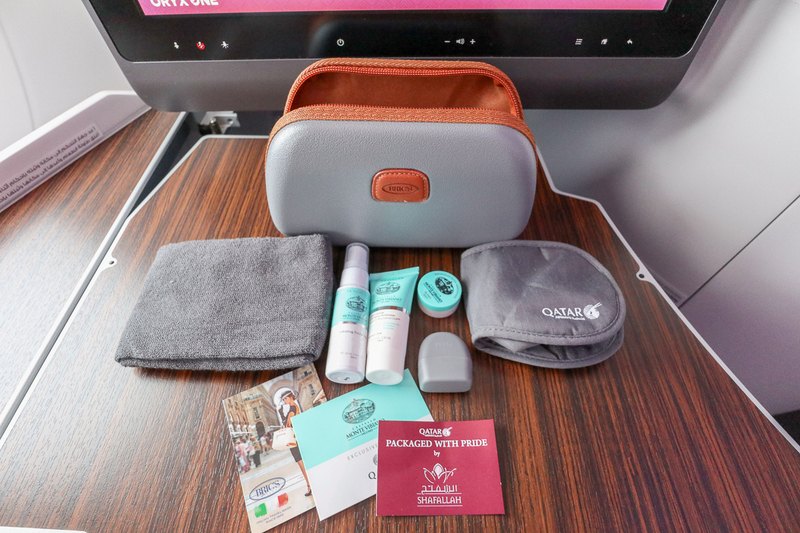 Interesting to see that you got an amenity kit as I flew DOH-MUC last year and they said that the kits weren’t offered on the shorter haul flights to Europe. 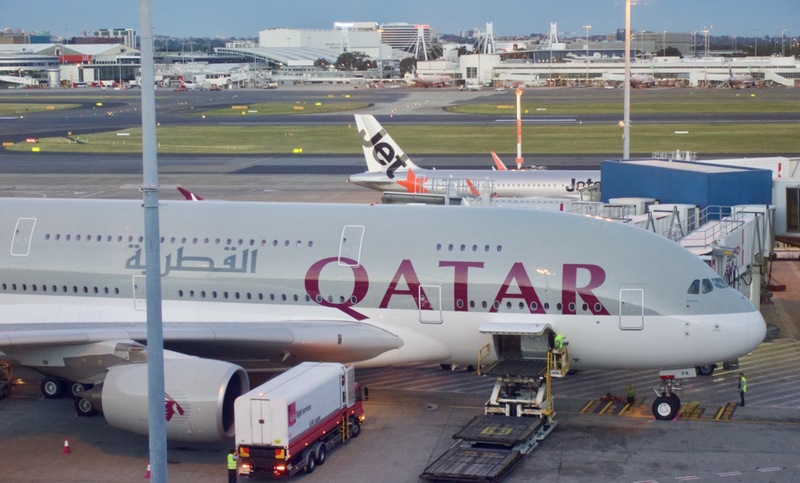 Any concerns to be had with flying Qatar in light of recent diplomatic issues with surrounding Arab countries. I’m flying MXP-DOH-SIN in September.